Sunday afternoon I was on an internet radio program called Burning Down the House hosted by architect Curtis Wayne and discussed the broad range of topics that have been covered in our Letters from Sweden series. Burning Down the House covers all matters of Design and Architecture and appears on the Heritage Radio Network - essentially an internet broadcast, the show went out by live stream on Sunday afternoon and is subsequently available as a Podcast. Heritage has a bunch of great shows on cooking and food, wine and beer, so all you foodies following out there may enjoy some of the shows they offer. Curtis had done his homework and proceeded to lead us through the broad range of topics that we have covered in the course of our study of Swedish housing. As you might expect, we were not able to plumb the depths of all this content, but we did speak in some detail about many points. Curtis suggested I come back for another show where we could delve into some of these areas in greater depth, an opportunity I'd welcome. There are several ways to listen to the show. Its on iTunes if that's your thing. Or you can listen online on their site, or download the audio file. If you are looking on the list it is show #81 from 11/13/11. Its best if you up the volume a bit since I was mumbling - I really got to work on my radio persona! Continue reading "Radio Show Interview - all about Sweden, Prefab, USA New Wall & Swedish Platform Framing"
Continue reading "Mineral Wool - first local install"
I've been working slowly on the Lagom House Construction Prints over the past few months. As the first of our house plans to feature the USA New Wall, and the Swedish Platform Framing right out of the box, I've had more than the usual amount of work to prep the plans. But we are almost there. Also a feature of the Lagom House plan set will be the unique foam insulation formed slab on grade. Similar to a frost protected shallow foundation, this is an "Americanized" version of the slab forms that are a commodity in Sweden. These allow for home foundations to be made quickly, with low labor and low material costs, resulting in a highly energy efficient foundation system. Beats spending money on muddy holes in the ground. Look for the plan set to break in the catalog very soon. We'll take pre-orders any time. In fact, if you are the negotiating type and you want pre-order discount, then you better get on the horn now, because once the plan set is posted to the catalog negotiation time will be over! Continue reading "0970 Lagom House Construction Prints - very close to finished"
Doh! Why didn't we think of that? Why not is a good question. Its because our standard of care is too low. Builders everywhere in the US use fiberglass batts with asphalt impregnated craft paper as their vapor retarder. This is trimmed loosely around obstructions and never achieves an air-tight barrier. Now that more builders are thinking about this I see decent air barriers installed, but the space between joists - spray foam is recommended. Another subcontractor, another process, another reason for a builder not to bother. 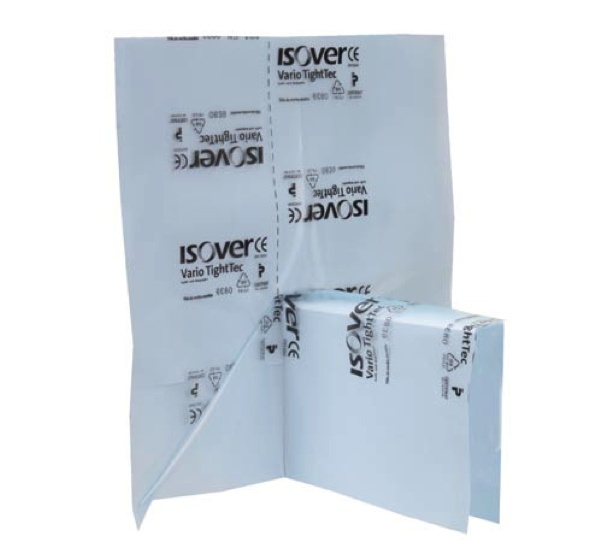 So that's why the Swedes have these clever folded vapor barrier sheets - so they can quickly wrap and tape off a penetration by a floor joist or beam. 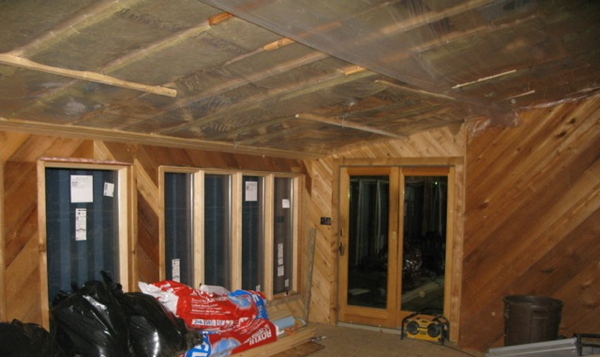 They don't need a special insulation for between the joists or new trades or subcontractors. 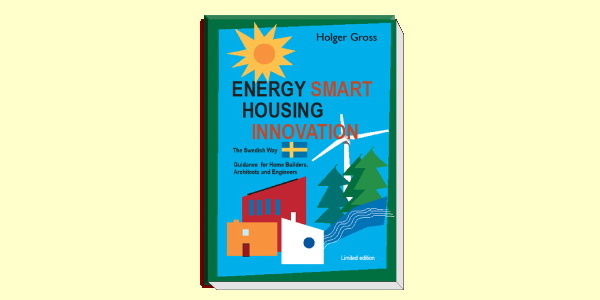 Continue reading "Raising our standard of care"
Continue reading "Energy Smart Housing Innovation, The Swedish Way"
Continue reading "0751 RS House - now direct from us"
Continue reading "0751 RS House - Photography of the finished house." This new home project from my local practice may be the first project to use a variation on the USA New Wall. But even if it does not we are vetting a number of interesting tech here and it should be fun to watch. 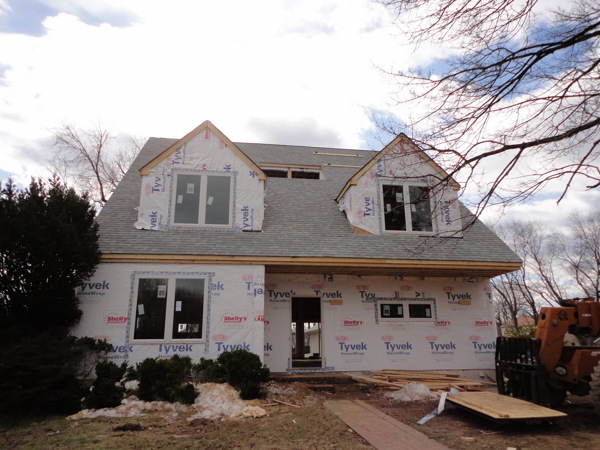 This is not a modern styled house, so no eye candy for our modern house following, but there will be lots of interesting tech and well worth watching the build. 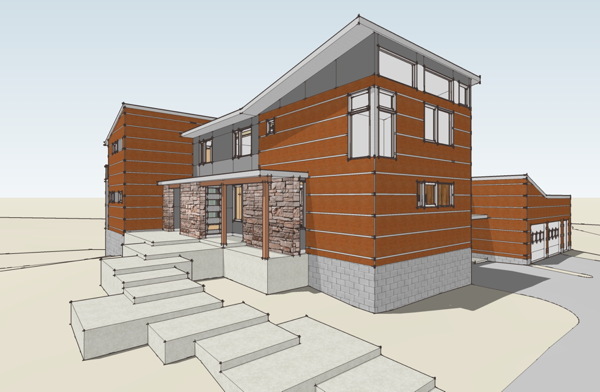 Even though the house has a craftsman style feel to the exterior, the floor plan is very modern, open plan, to accommodate contemporary living. And as the name suggests it will be Leed Certified. 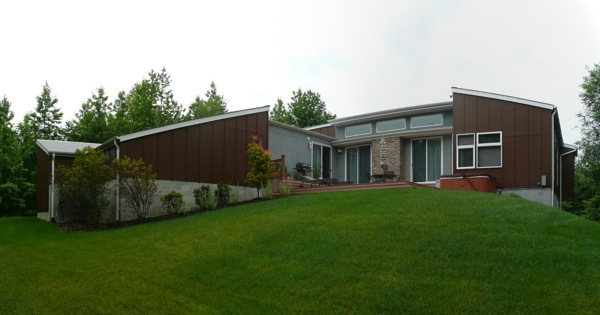 This house is utilizing Superior Walls, a precast, and pre insulated basement wall product. 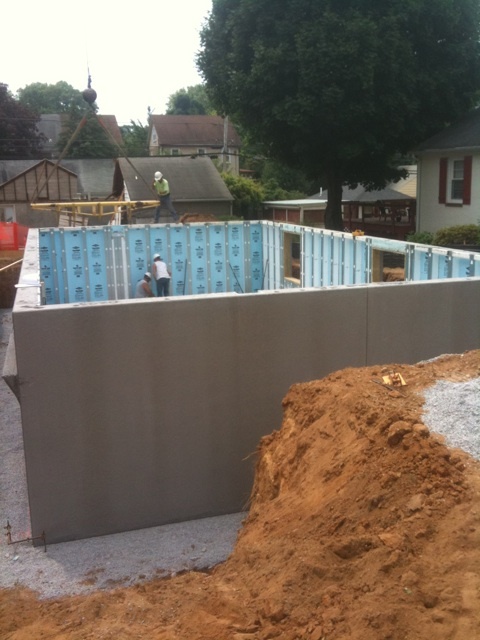 This allowed the basement to be installed in one day - no concrete formwork and much abbreviated prep time. 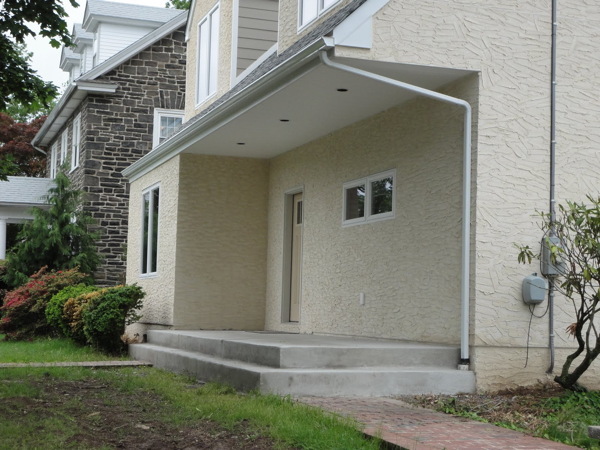 Rather than a conventional footing and fragile, relatively speaking, basement wall, the precast wall is very strong and stiff and only requires a stone bed beneath it. This stone bed spreads the load out to meet the undisturbed soil at with a load pressure within its bearing capacity, and this is how it precludes conventional footings. We are encouraging the use of Mineral Wool in a USA New Wall Better Wall configuration. 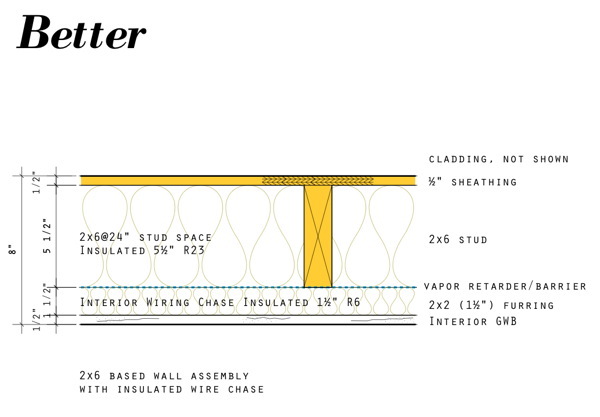 It may instead use foam and blown in cellulose, but still in the Better Wall configuration. In case you are curious this will not be using Swedish Platform framing, rather conventional western platform framing is being used. But the Better Wall configuration with an exterior insulation layer does improve the thermal bridges inherent in western platform frame. 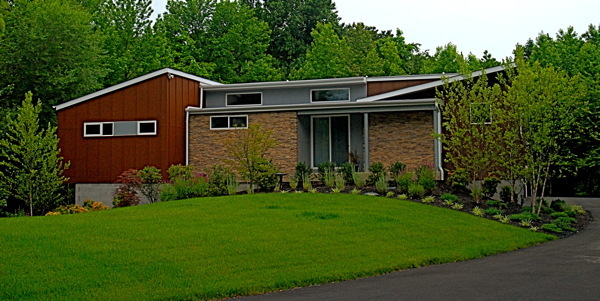 Our client Intersect Homes is the owner/builder of this project, so we have a build dedicated to building green. Slide show below after the jump to get more of a feel for this project as it starts. 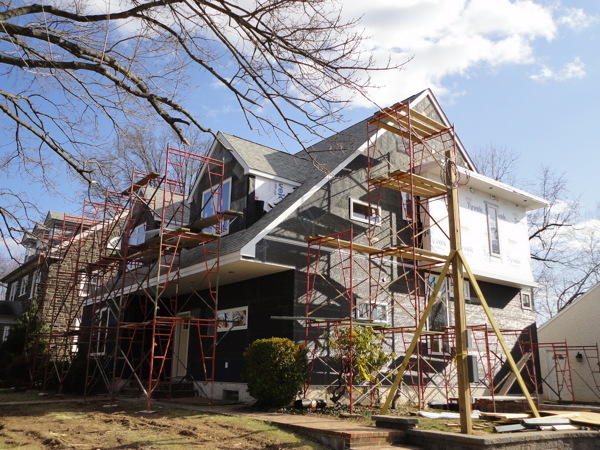 Continue reading "West Chester Leed House - new local build"
The second configuration of the USA New Wall we are going to look at is the Better wall. The Better wall is all about breaking the thermal bridge of the wall framing. We start with the Good wall, and add insulation layers inside or outside that keep the studs from sending your heat directly through the wall. The framing of the wall is still kept simple so you already know how to build this. The Better wall comes in two flavors, so lets start with the interior insulated wire chase version. We add an interior wire chase to a basic wall which provides a space to run wires and mount electrical boxes that will not puncture the vapor retarder/barrier. This is a huge asset for maintaining the air-tight envelope of the house. Wires are easy to run, and can be snugged between the furring and vapor retarder. Plumbing supply lines can also live in this space. Continue reading "USA New Wall - The Better Wall"
The first configuration of the USA New Wall we are going to look at is the Good wall. The Good wall is all about what is the greatest gain for the least effort. How can we make the wall we build every day perform better without loosing any sleep or worry about how to build it. We don't want to know about sprays or blows - we want to work the way we know how to, but we want to build a Good wall. The Good wall is all about increasing the insulation value in the wall cavity. 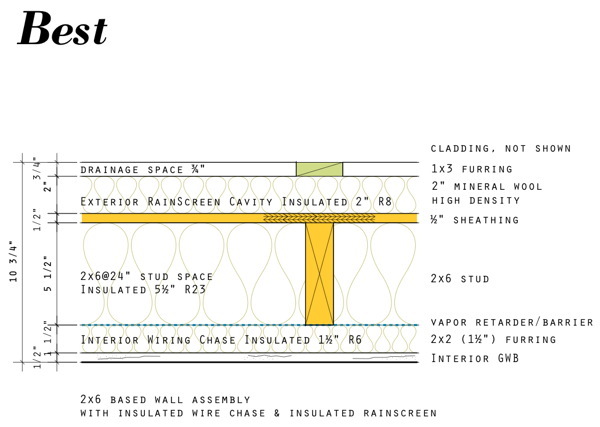 So first of all we use 2x6 studs and the configuration of the framing is expanded to 24"oc. Mineral wool batts rated at R23 are used in place of the more common fiberglass at R13 or R19. Mineral wool batts are unfaced, so that means we need to introduce a vapor retarder or vapor barrier membrane. Which you use will depend on which climate zone you are located in, and whether or not your home has air conditioning. Continue reading "USA New Wall - The Good Wall"
One thing I've discovered at I have studied Swedish building techniques, and eventually how to apply them here, is that there is a storm brewing in building science in the US. There are many differing opinions on what is the best approach to improving performance, and as many expert opinions as there are, there are multiples of lesser informed second hand opinions spiraling off of the expert opinions. Through all this I see nobody talking about how to bring the reluctant building industry into these higher performance practices. Nobody is considering the reality of an entrenched and mature industry, with supply lines and practical experience which will not be willingly cast aside. This is where the USA New Wall comes in. The USA New Wall design is informed by the building practices in Sweden which are in turn a natural evolution of the building techniques widespread in the USA. By looking at the results of 30 years of building science development in Sweden we can take away some very plain lessons on how to improve our building without upsetting the apple cart that is the industry. 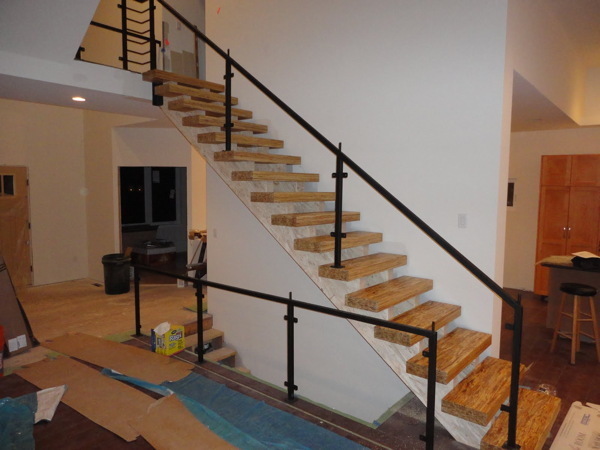 Continue reading "USA New Wall - Good, Better, Best"
Continue reading "MoTrad House - porch and patio"
Continue reading "MoTrad House - rails part III"
The rail for the stair has arrived, and before it went in the temporary stair treads were OUT, and the final stair treads were IN. 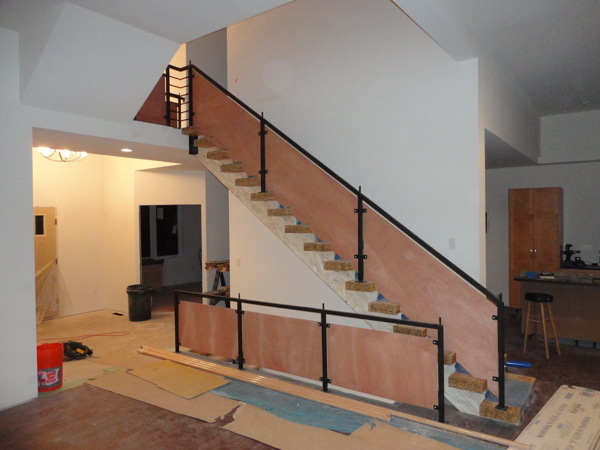 All of the rails still await the in-fill panels that will complete them, but for the time being its a bit less precarious going up and down the stair. I really like the parallel strand lumber that was used for the stair treads. This is an engineered wood product made by laminating small strips of wood under great pressure. The resulting wood is stronger and more consistent than solid wood lumber and it is used for structural beams in wood frame construction. This is a great appropriation of that material for another use where the interesting grain pattern can be displayed. More photos after the link below. 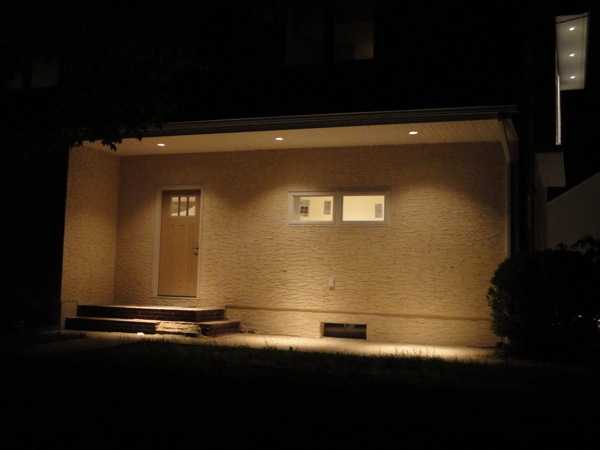 Continue reading "MoTrad House - rails part II"
Continue reading "MoTrad House - night shot"
The house is "rocked" as they say. The gypsum wall board hangers came, and my client reports they hung the drywall in one day. 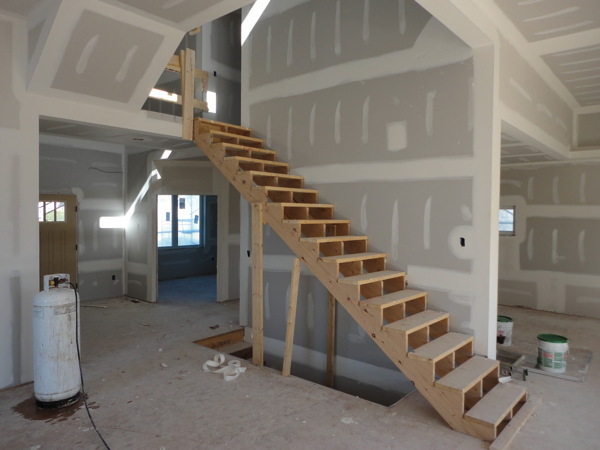 Like a gypsum tornado, an experience crew can make short work of drywalling a house, even a house such as this one with some odd angles, and some very high spaces as you will see in the photographs. While the gypsum magic was happening inside, the plasterers were busy outside trying to get the stucco coats on the house. Unfortunately the weather has not cooperated and we've had a late March revisit of February weather. Its been too cold and they have to come back when it warms up some. More photos in the photo browser after the link - you know what to do. Enjoy! Continue reading "MoTrad House - sheetrock happens"
On the way to a visit to Bensonwood in New Hampshire we made a stop in Connecticut and paid a visit to this unique modern house right on the coast of the sound. The house had just been published in the New York Times last week and when we realized that it was nearby we took a drive over to see it. 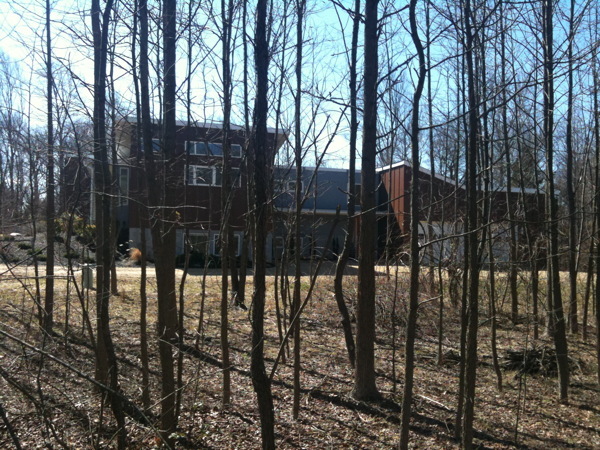 We met the architect, Gernot Bruckner, who was kind enough to give us a tour of the house. He is marketing the house and several other very cool designs in a "build on your site" business model which is an interesting approach. The house is beautifully done, a minimalist box on steel pilotis, reminds me of LeCorbusier's exhibition house at Stuttgart, and the striped work of Swiss architect Mario Botta. Gernot rolled up his sleeves and completed many of the custom details that really distinguish the house from everyday construction. We wish him luck! Check out his offerings at Brio54. 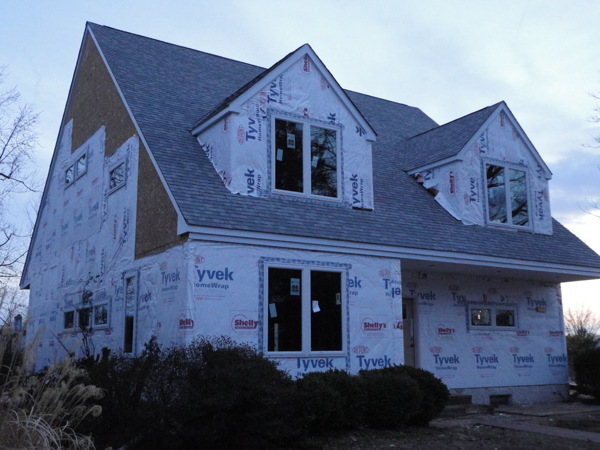 Well the Motrad house is not exactly putting on a tux and stepping out on the town, but it has gotten a second wrap of black asphalt coated building paper and reinforcing mesh in advance of the start of stucco application. 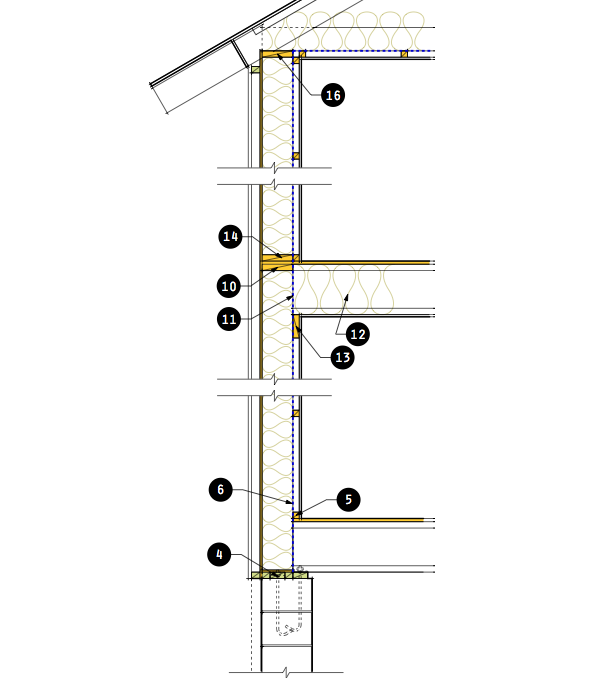 What we have as a result is the first indication of the different materials the house will have on the facade. The areas now wrapped in black paper will start receiving stucco - like as I am writing this. The areas wrapped in the white house-wrap material will receive wood siding panels - I think, at least the last time I spoke to the owner specifically about this..! In either case there will be a second and contrasting cladding material on these areas which will emphasize the form of the house. A few more shots in a slide show after the link below. 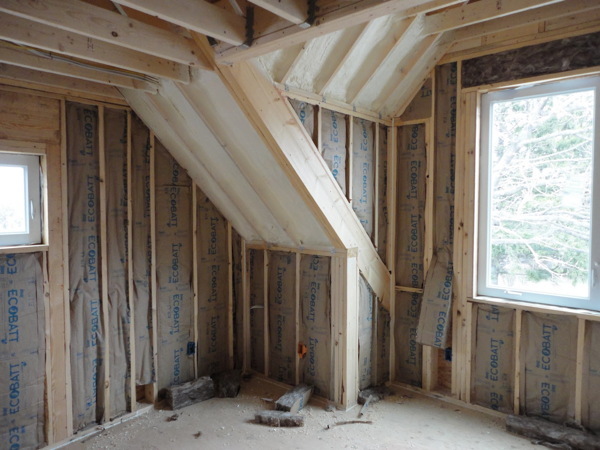 Continue reading "MoTrad House - black tie and tails"
The rough in of electrical and plumbing is complete and the insulation of the walls, roof, and ceiling have begun. The owner is using EcoBatts by Knaupf insulation, a european company that has brought this recycled glass batt insulation to the US. R-values are consistent with other fiberglass batt products. Notably the glass fibers are brown from the color of the various recycled glass that goes into the mix. A few more photos after the continue reading link below. 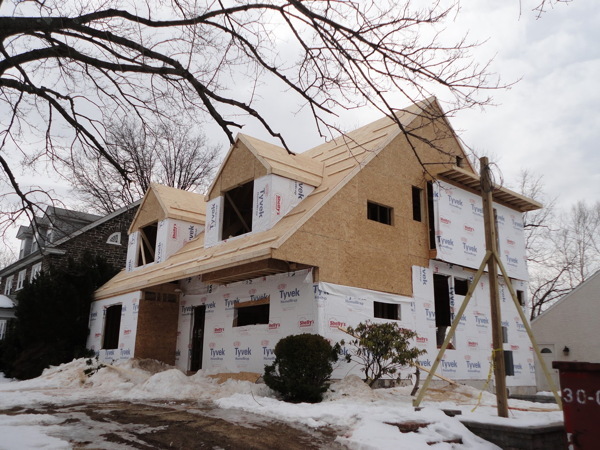 Continue reading "MoTrad House - insulation"
The owner passed along a few photos shot through the trees on the side of the lot. Still winter, hinting at spring. I'll visit and take some photos once there is green in the trees. Continue reading "0751 RS House - some late winter photos"
Continue reading "MoTrad House - plumbing begun"
Continue reading "Motrad House - roof on, windows in"
So called Advanced Framing has been promoted as a technique to improve efficiency and energy performance for house walls. But it also seems to have been designed to ensure that nobody adopts it. First we should cover the basics - what is Advanced Framing? 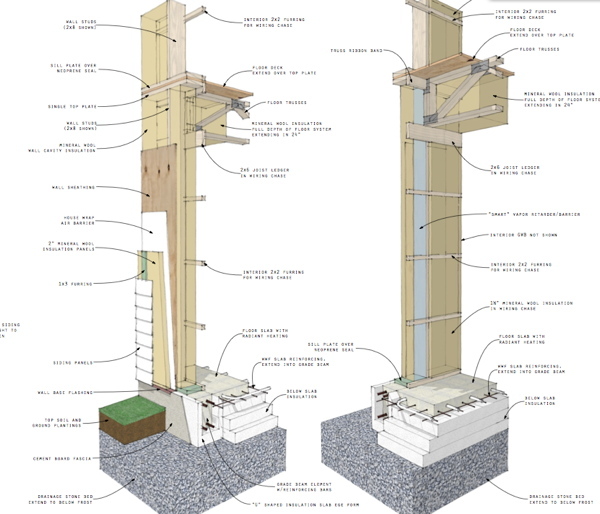 It is a "system" or practice of house framing that endeavors to reduce the amount of wood going into the wall, and as a result reduce thermal bridging and increase energy efficiency. It is also interchangeably referred to as Optimum Value Engineering or OVE which perhaps speaks more to the process that came up with this. Value Engineering has come to be a euphemism for cutting costs. In this case, cutting out everything but what is essential to frame a house. Before we look at exactly how Advanced Framing accomplishes these goals let me just air my gripe. The details of the AF framing techniques are smart, efficient, and dare I say common sense. Yet taken as a whole "system" it is overly rigid, inflexible, and lacks resiliency. To follow a strict application building elements must fall on the proposed modular grid. 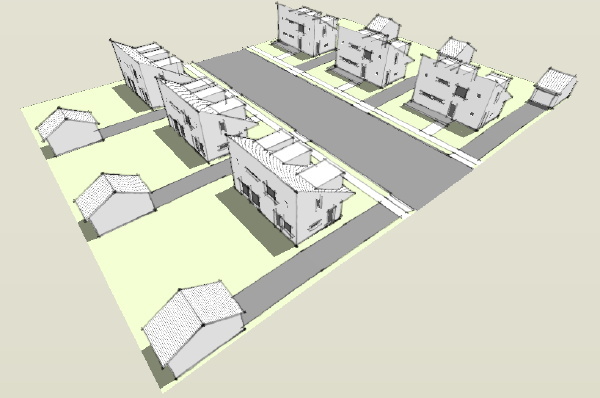 This limits possibilities, and dooms existing house plans to significant redesign. Its lack of resiliency means its advantages can be quickly overcome by deviation from its strict use. And while it can save up to 20% in material, it really does not go far enough to create a high performance wall system. I feel this combination is a barrier to adoption that will prevent it from becoming the de-facto method for framing houses in the US. Yet many of the individual details are easy to implement, and many builders have already taken this hybrid approach. With the help of this diagram lets look at some of the key aspects of AF, the ones that are easiest to adopt. 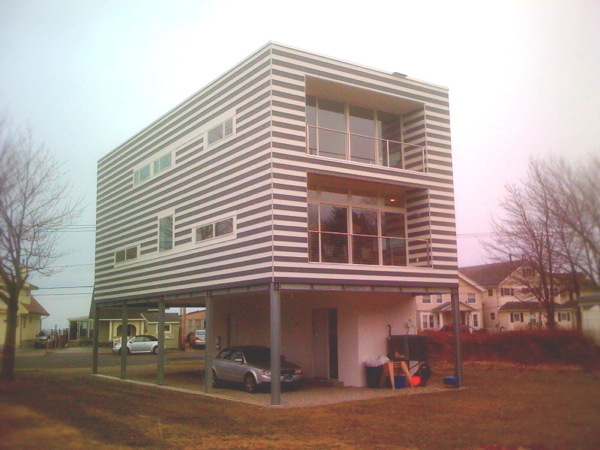 Continue reading "USA New Wall - so called Advanced Framing"
Today, on the occasion of the official introduction of a (sort of) new house plan design - the northside version of our Lagom House - I thought it would be worthwhile to review the design in its entirety to make clear how this relates to the Lagom House we've been looking at for the past year. 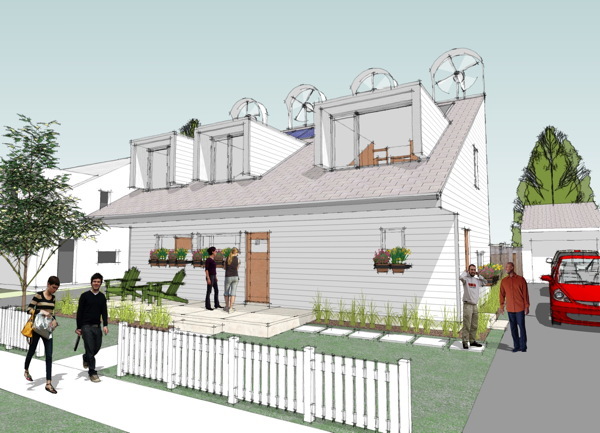 This new version of the Lagom House features the same smart plan layout. At just under 1500sf, and with 2.5 baths and 3 bedrooms, it delivers an open living/dining room with separate but connected kitchen, a small home office area, and a homework area for the kids. It is a very family friendly yet very compact home. This is a house that is small enough to be a first home, a "starter" home if we can still use that term in today's world, but lives large enough for a family of four. 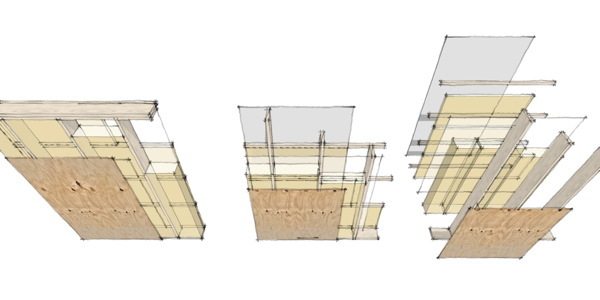 Continue reading "0970 Lagom House - Design Prints for new northside Lagom House are ready"
The framing of the shell of the house is now done. 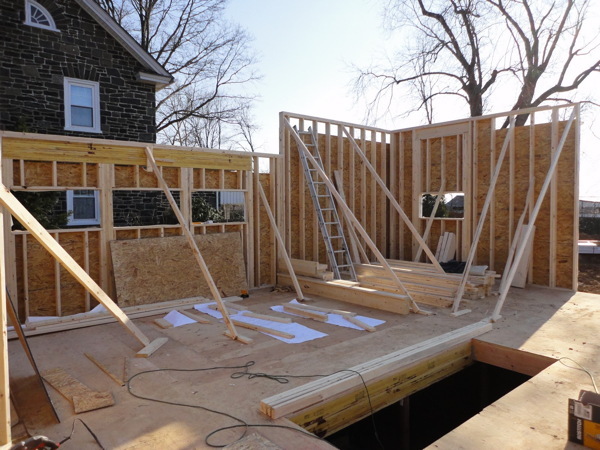 There is a little bit more of partition framing going on inside, but soon the Electricians, Plumbers, and HVAC men will be on the job installing the guts of the house. Finish work to follow. I'm very pleased with the how the house is coming out. The progress photos line up very nicely with the design sketches which is very gratifying. And best of all its shaping up to be one very cool house! And after the link we have a photo browser with more pictures - enjoy! 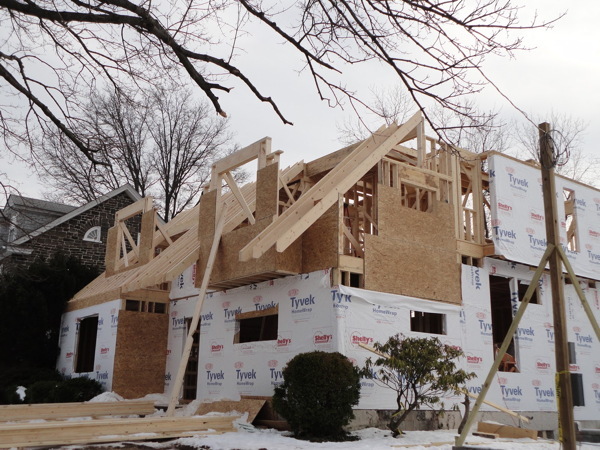 Continue reading "Motrad House - house shell all framed up"
Progress with the Lagom House lot visualization. Continue reading "0970 Lagom House - design print progress"
If you recall any of the details of the 0970 Lagom House that was entered in a green house design contest last year, you may remember that there were to be multiple versions. 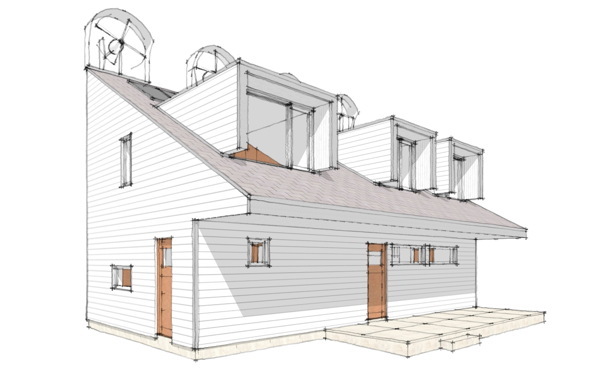 The initial version posted to the catalog was configured to be on the south side of a street, with the roof facing south for solar exposure. Soon we will also have design prints available for the north side configuration. 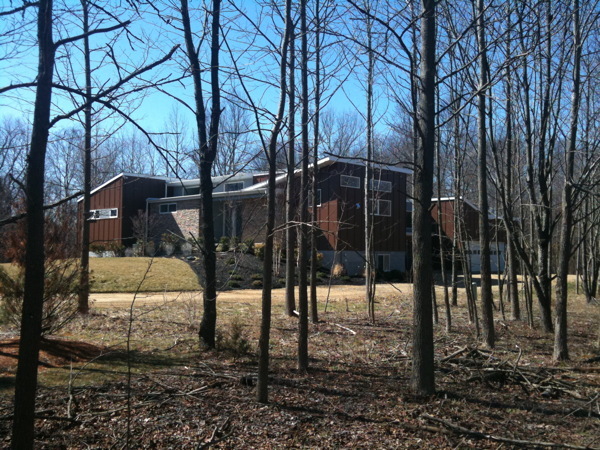 The south side version faces the sloping roof towards the back yard, while the north side version faces the sloping roof towards the street. Once this second versions design prints are ready we will move on to prepping the Construction Prints for this efficient house design. This will be the first plan set to be documented to use our New American Wall system for high energy performance. 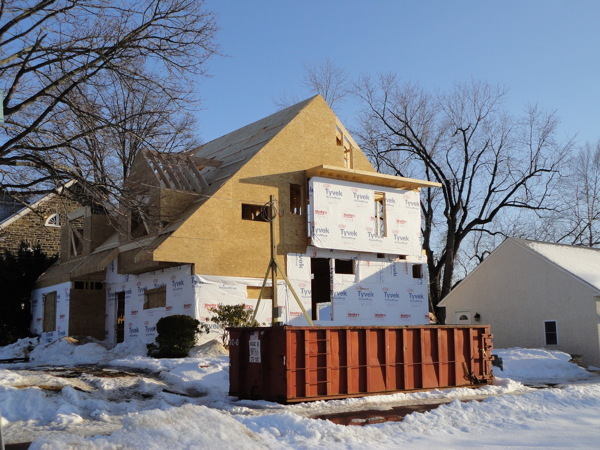 Continue reading "0970 Lagom House - northside version underway"
Continue reading "MoTrad House - snow does not let up"
As the rafters begin to go in you can start to get a sense of the massing of the house. 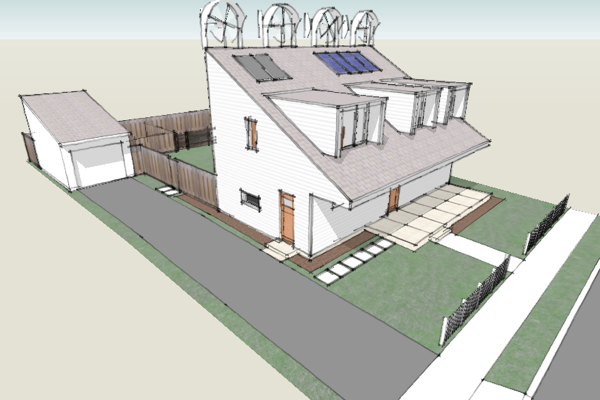 If you take a look at the project page at our web site you'll see more illustrations of how the house will finally appear. This may help you make sense out of what the rafters are doing here. 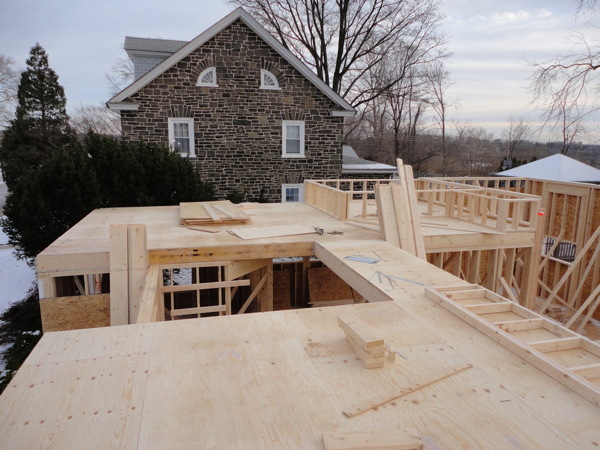 Continue reading "MoTrad House - rafters landing"
The second floor partitions, and the roof in as much as it is tied together with the partitions, have begun to be framed up. Very soon the overall massing of the house will take shape. Already you can start to get a sense of the second floor spaces. So click through to see the most recent photos from the second floor. 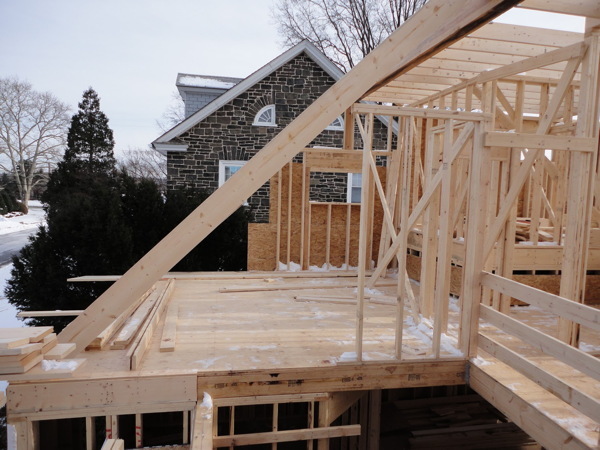 Continue reading "MoTrad House - second floor cometh"
Continue reading "MoTrad House - second floor platform done"
We've been kicking this idea around for about a year, ever since we created our 0970 Lagom House for a design contest. Inspired by our study of Swedish construction we wanted to create a high performance wall for the US market that lent itself to panel fabrication, and was accessible to any builder using the skills and experience they already have. Why not use new materials and techniques? How can you make a New Wall that everybody is going to know how to build? We want to create a wall that can be widely adopted, something that any builder can start building tomorrow without any new training, without finding any new suppliers, with out changing the way they run their business. If we want the greatest number of builders to build more efficient houses we need a wall they understand immediately, we need a wall that they can purchase materials for from their existing suppliers, use their existing sub-contractors, and a wall that is familiar enough for them to reliably price and schedule. New materials and new techniques throw off all of this and become barriers to adoption. We don't want barriers. We want everybody to start building more efficient houses. 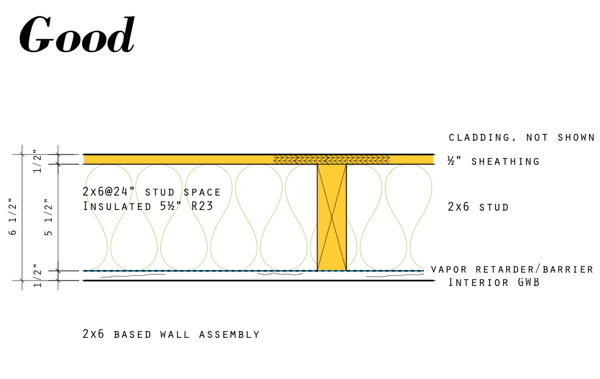 Continue reading for a detailed explanation of this simple but robust wall. Continue reading "USA New Wall - a proposal for a high performance commodity wall system"
Continue reading "MoTrad House - damn the snow, keep on framing"
Continue reading "MoTrad House - framing up"
Continue reading "Letters from Sweden - The path lies in revising our roles"